Kaliningrad is a paradise for a long walks and relax. Located by the see, this ancient city is ready to surprise and fascinate its guests.Visited Kaliningrad one day, you will fall in love with its narrow cobbled streets and shady chestnut avenues forever. Probably the main reason to visit kaliningrad is its amazing history. German city, which became a part of Russia, keeps a bits of Russian and Soviet periods. Only here it is possible to see how majestic century-old European architecture is adjacent to the typical Soviet buildings. Even in the modern city center it is easy to see a traces of the past in the fire hydrants, windows of houses and surviving cast iron fences.Only here you can visit the ancient castles of the Teutonic order, wander through the dark forts, which remember the blood battles of the World War II and touch the history quite literally. The Sea is the second reason to have a vacation in the most Western point of Russia. Being willful and harsh, the Baltic Sea is not suitable for lazy beach vacation, but gives an opportunity to enjoy the fresh and healthy air, coastal walks and fascinating landscapes. And the main symbol of the Kaliningrad Region - Amber- can be found here on the beaches after a storm. The unique nature of the region is amazing. You should definitely visit the Curonian Spit National Park, where the ancient pines line up along the coast of the sea and the Curonian Lagoon to show their guests a secret paths. The Baltic Spit with its wild nature and abandoned airfield Luftwaffe is also worth visiting. The mysterious forest is the third reason to fall in love with the Kaliningrad Region. Go to the East of the region and wander through the mysterious Rominta Forest. Hundreds of years ago this forest was the Prussian kings’ favourite hunting place. Whatever interests you have, Kaliningrad will impress you. There are a lot of shopping gallery, markets and family stores here for shopping lovers. 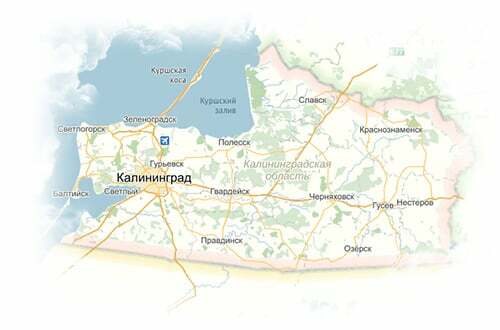 Gourmets find here an excellent restaurants to go to a gastronomic journey to Europe without leaving Kaliningrad. A variety of museums and art spaces will appeal to intellectuals.All kinds of city routes are ready for lovers of hiking, but local resorts - for everybody who in need of relaxation.Whatever your soul desires, it can be found in Kaliningrad, even if your mood is as changeable as the Baltic weather. Advantages of the travel agency "Cvet"
Compact touristic groups of 8-18 peopleGuides are adjusted to the pace of the group and excursions do not pass swiftly. Our guide tours function according the system "All inclusive"There are no hidden surcharges. Accommodation, transfer, excursions are already included in the price. Our transport is always modern and comfortable for all categories of peopleWe have no buses from the 90-th. And our polite and attentive drivers will help you to make the way to the sightseeings safe and easy. You will be settled in modern city hotels Or in famous antique German villas. Our guides are inventive and wittyWith rich experience of excursions, interactives, historical quests and quizzes. We can pick you up from any point of cityIf your excursion group consists of more than 4 people. Впечатления: Индивидуальный тур: Калининград, Балтийск, Балтийская коса, Куршская коса, рыцарские замки. Гид Александр. Замечательное сопровождение. Я выросла в Балтийске в те годы, когда балтийская коса была закрыта. Привезла внучку в этот прекрасный край. Даже для меня было много интересного. Очень довольна, рекомендую всем.